Hi there blog friends! Here's hoping wherever you are it's warm and comfy. It's another storm weekend in Maine and well below zero. Today, over at Outlawz Challenges Clean and Simple Challenge it's Lynn's turn to post a challenge and she's challenging us to take a trip into fantasy land. This week we are off to 'Fantasy' Land. We challenge you to bring out those dragons, fairies, goblins, mermaids, elf, gnomes, goblins, etc. in true CAS style. This is a really fun challenge - check out all the DT examples and you'lld be inspired to play along with us I'm sure of it. My sponging hand got a little heavy on this bg, however, I love that little Repeat Impressions fairy image (RI# 4302-I "Fairy's Fun/Bumblebee") and the bg doesn't seem to overwhelm her. The image was colored with Copics and then I made a mask and sponged the bg. I plan to CASE myself some time in the near future and see if I can't make some sponging improvements and create this card the way I first "saw" it in my mind. Come on over and play with us at the new CAS challenge. Thanks so much for stopping by. I hope you all have a great week. I'll be back on Wednesday with a new inspiration challenge for The House That Stamps Built. See you then. 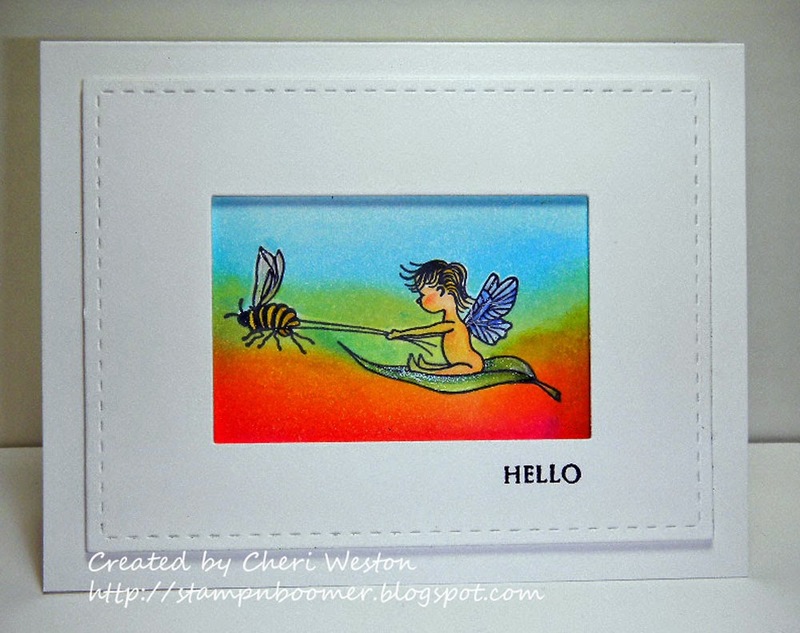 Cheri- This is so sweet and I can think of a lot of people that would love to receive it. Lovely background with the bright colours and such an adorable image.